If you want to leave your mark on history, ask the waitress behind the bar for a staple gun and a sharpie! The Oatman Hotel is home to the Dollar Bill Bar, a saloon covered floor to ceiling in...you guessed it...dollar bills. 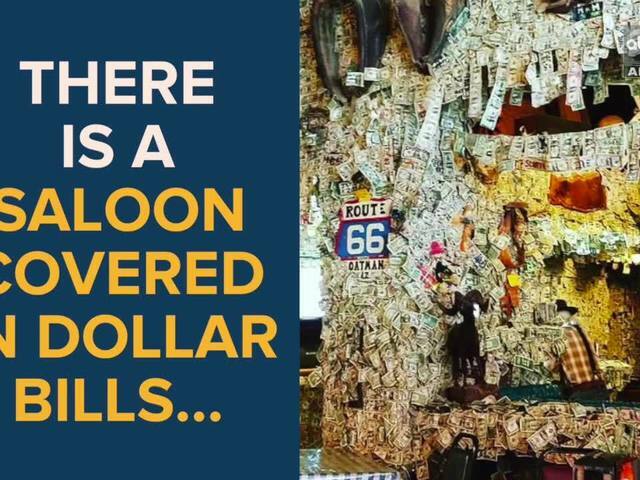 This unique watering hole is one of a handful located in the United States where the walls are actually decorated with money. Watch the video above and try to estimate how many dollar bills are inside the bar! Back in the early 1900s, Oatman, Arizona was a tent city turned mining town located along Route 66. The Oatman Hotel, called the Drulin Hotel, was established in 1902 and served as a popular rest stop. Travelers would rest their feet at the Restaurant and Bar then try to catch some z's in one of the famously haunted rooms. Guests share tales of playful spirits that find entertainment in raising glasses and lifting money off the bar at the saloon. When the miners received their paychecks, they would write their name on a dollar and stick it on the wall. This served as a tab of sorts. If the patron needed extra cash to pay their tab during return visits, they would find their name on the wall and bring the dollar to their waitress. RELATED: There is a hidden train where you can party with bald eagles in Arizona! ALSO: This restaurant is located in the middle of nowhere!